This clever Bar Mitzvah invitation is raised printed on tri-fold recycled brown kraft card stock and has been die cut and perforated to resemble a ticket. This clever Bar Mitzvah invitation is raised printed on tri-fold recycled brown kraft card stock and has been die cut and perforated to resemble a ticket. “Admit One” appears on the front and your wording details appear on the inside middle panel. Measures 5-1/2″ wide by 4-1/8″ high when folded. 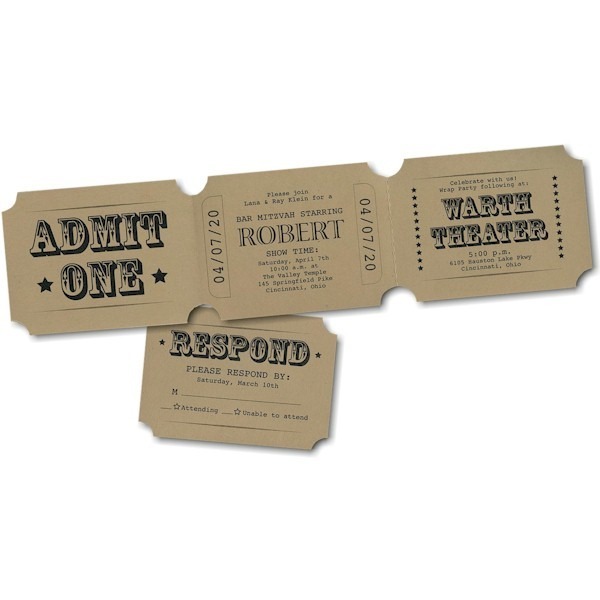 Shown with Black ink and lettering styles only as shown. The Response enclosures will print on single brown kraft stock and the Informal Thank You notes will print on matching folder stock. This Bar Mitzvah invitation is accompanied by single white envelopes.